Hubei, China, May 11, 2015. Chinese police captured a fugitive who revealed his whereabouts by posting holiday selfies on a social media web site. The 27-year-old man surnamed Qin went into hiding last year after reputedly being hired as a hitman and seriously injuring his target, a villager in central China's Henan Province. On May 3, the last day of the May Day holiday, Qin emerged on the popular messaging and photo-sharing web site WeChat and posted selfies taken on Wudang Mountain in Hubei Province, which neighbors Henan to the south. The photos were forwarded by an unwitting friend of Qin's and got the attention of the police. Wudang Mountain police said on Monday that they quickly located Qin by identifying the photos' backdrops and made the arrest on May 5. According to the police, Qin told them that he had joined a group of friends on the mountain tour and, believing that "the most dangerous place is the safest", even registered in a luxury hotel right beside the police station. He posted the selfies as the relaxing trip made him complacent about his fugitive status, he said. The lesson of this story: stay off social media. Maxi Sopo told his Facebook friends, including a former justice department official; he was living in paradise in Mexico, some people take to becoming a fugitive like a duck to water. They lie low, go out only in disguise, and even create whole new identities. Others, it would appear, do not. Take the case of Maxi Sopo, a 26-year-old criminal in hiding in Mexico who not only used his Facebook status to tell all and sundry what a good time he was having, but also made the somewhat elementary error of adding a former justice department official to his list of friends. In status updates from Cancun, where the Cameroon-born fugitive was on the run from charges of bank fraud in Seattle, he said he was "living in paradise" and "loving it". Michael Scoville, the assistant US attorney who helped find the fugitive, described how Sopo's updates described his lazy days on the beach and wild nights on the town. "He was making posts about how beautiful life is and how he was having a good time with his buddies," Scoville said. "He was definitely not living the way we wanted him to be living, given the charges he was facing." With spectacular lack of caution, and in capital letters just in case anyone should miss the sentiment, on June 21 he wrote: "LIFE IS VERY SIMPLE REALLY!!!! BUT SOME OF US HUMANS MAKE A MESS OF IT ... REMEMBER AM JUST HERE TO HAVE FUN PARTEEEEEEE." Sopo, who arrived in the US in about 2003, made a living selling roses in Seattle nightclubs until, according to prosecutors, he moved on to bank fraud. He apparently drove a rented car to Mexico in late February after learning that federal agents were investigating the fraud scheme. Investigators scoured social networking sites such as Facebook and MySpace but initially could find no trace of him and were unable to pin down his location in Mexico. Several months later, a secret service agent, Seth Reeg, checked Facebook again and up popped MaxiSopo. His photo showed him partying in front of a backdrop featuring logos of BMW and Courvoisier cognac, sporting a black jacket adorned with a not-so-subtle white lion. Although Sopo's profile was set to private, his list of friends was not. Scoville started combing through it and was surprised to see that one friend listed an affiliation with the justice department. He sent a message requesting a phone call. "We figured this was a person we could probably trust to keep our inquiry discreet," Scoville said. Proving the 2.0 adage that a friend on Facebook is rarely a friend indeed, the former official said he had met Sopo in Cancun's nightclubs a few times, but did not really know him and had no idea he was a fugitive. The official learned where Sopo was living and passed that information back to Scoville, who provided it to Mexican authorities. They arrested Sopo last month. He had been living in an apartment complex, working at a hotel and partying at Cancun's beaches, pools and nightclubs, Scoville said. Sopo is accused of masterminding a bank fraud scheme with Edward Asatoorians, who was convicted by a federal jury in Seattle last week. The court heard that the pair persuaded young co-conspirators to lie about their income to get loans to buy imaginary cars, and then used the money to prop up Asatoorians's business and to take an expensive trip to Las Vegas. Asatoorians is expected to be sentenced to at least five years in prison. If convicted, Sopo could face up to 30 years. Whether the US authorities will allow him to update his status should that happen remains to be seen. The micro-blog account of Lai Changxing, a Chinese fugitive accused of economic offence who is now living in Canada, has been cancelled shortly after it was verified by its host site Sina.com on Wednesday morning. Lai released his first micro-blog post – and also the only one – with the verified account, saying that he was "in Vancouver" at 4:28 am Wednesday. He was then followed by thousands of netizens. 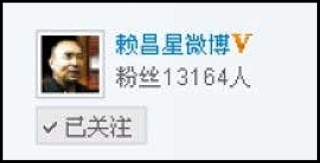 Lai's blog account was shown as verified at 11:05 am of Wednesday, but the V sign standing for a verified account had been cancelled when a reporter from the Global Times visited the site again at 11:20 am. However, the number of Lai's followers had soared to over 13,000 by then. The account then disappeared after about ten minutes. The website shows that "the user you visit does not exist", when netizens tried to enter Lai's micro-blog site. Some netizens doubted whether the account was Lai's, even after it had been verified. An editor of Sina micro-blog told the Global Times via telephone that the name of each verified account belongs to a unique person, and they can only be verified after personal information is investigated by evaluators of Sina. Fang Xingdong, founder of Blog China and the Internet laboratory, said that criminals (regarded) like Lai are less likely to be approved to open blog accounts, though laws may not forbid them of having one. Fang considers it may due to the problem of identity investigation and technological operation process that Sina verified but finally canceled Lai's account. He added that the multiplication of followers in no time was merely due to curiosity. "If the account still exists now, the number of followers may have reached tens of thousands," Fang said. Lai, a real estate merchant whose smuggled value edges on 10 billion US dollars, fled China in 1999 for Canada, where he has a work permit now, living in Vancouver. Perrone was one of Italy's most wanted fugitives for the past 10 years, until the Italian police tracked him down through Facebook. He was living under the name Saverio Garcia Galiero in Tampico, a port city at the southeastern tip of Tamaulipas, a state in Mexico's northeastern corner. Galiero is Perrone's mother's maiden name, which may have aided authorities in the search for him. The police did not disclose how exactly they tracked Perrone down through the social-media site. But Italian authorities do have broad powers in organized-crime cases, meaning they could have been monitoring the online activity of Perrone's associates in Italy, AFP notes. Image-recognition software may have played a role as well. "This arrest is part of a larger strategy being coordinated by the anti-crime division of the Italian police to capture mafia fugitives who have been taking refuge abroad for many years,"authorities said in a statement. "There were some joint operations between Mexican traffickers and Italian mafia groups some years ago," Antonio Mazzitelli, a regional representative for the UN Office on Drugs and Crime,told Reuters. "It's frequent that in the criminal world, criminal organizations collaborate on trafficking matters."